For more than 20 years Jan Patek has been designing primitive folk art quilts and publishing the patterns in books. Jan also designs original fabric lines for Moda. 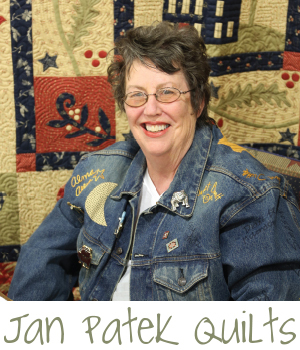 You can see all of her fabric turned into quilts on Jan’s website - www.janpatekquilts.com - as so many others have. Join one of Jan's great quilt clubs. Browse the books and quilt kits, relax, and be reminded of country, home, and family.